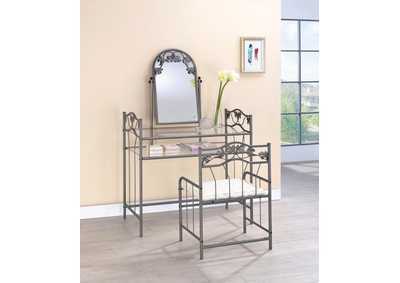 Treat yourself to a vanity set that exudes the warmth and charm your bedroom oasis deserves. This vanity set features two glass shelves to store and display makeup, perfumes and collectibles, along with a small rectangular mirror detailed with floral leaf accents in metal. Finished in nickel bronze, this vanity also comes with a matching armchair with cream upholstered cushioning.